Wash brinjals and roast them on the direct flame of the gas burner. Roast the brinjals well till they turn black in color. When all the brinjals are roasted keep them aside for cooling. Holding the stem, remove the outer skin of the roasted brinjals. Check for worms inside the roasted brinjals by cutting them with a knife. Then cut the stems also and mash the roasted brinjals with fingers and keep that bowl aside. Wash and clean the tomatoes. With a V-slicer or in a food processor or with a sharp knife cut tomatoes into thin pieces. Heat a pan and add oil to it. When oil is hot add the fenugreek seeds and black gram. Fry till the seeds start changing color. Then add mustard seeds and fry till they splutter. Then add the cut green chilies and fry till they are crisp. When the chilies are fried well add asafoetida and mix well. Then add cut red chilies and mix. Then remove the fried seasoning ingredients from the oil and take them into a mixie jar. In the remaining oil add the tomato pieces. Add salt and turmeric powder to the tomato pieces and mix well. Cover the pan and cook the tomatoes on medium heat. When water oozes out of the tomatoes and you observe that the tomato pieces are cooked, remove the lid. Cook without the lid till some water is evaporated. Take care not to evaporate the entire water and make the tomatoes dry. Once finished cooking the tomatoes, separate tomatoes from water with the help of a slotted ladle. Grind the seasoning ingredients. As we need water to grind the seasoning ingredients to a thick paste, use the tomato water for grinding. Do not grind the seasonings to a fine paste. The mixture has to be somewhat coarse to give nice taste when the chutney is prepared. Add this ground seasoning mixture to the pan and grind the tomatoes. Once again, do not grind the tomatoes to a fine and smooth paste. When the tomatoes are ground coarsely the texture should resemble the tomatoes ground in a mortar & pestle (ROLU). With the coarse texture of the ground tomatoes and seasoning, the chutney gets a special flavor. Add these ground tomatoes to the ground seasoning in the pan. Add the mashed roasted brinjals to the pan. Add some chopped coriander leaves to the pan and mix all well. Now the chutney is ready— Transfer it to a serving bowl. Garnish the pachhadi with the remaining chopped coriander and serve with hot plain rice. After roasting the brinjals do check for the worms. If you find one scoop out that portion with a spoon and discard it. Mash the roasted brinjals with fingers so that we get the right texture and good taste for this chutney. Cut the tomatoes into small pieces for fast and even cooking. Fry the green chilies in oil till crisp to remove the hotness. Never grind the fried seasonings and the cooked tomatoes to a fine and smooth paste. The taste of the recipe depends on the texture of the mixture ground. Brinjal tastes good when it is fried well in oil---for any variety of brinjal preparation—be it chutney or a curry. If we use less oil for a brinjal preparation, then one has to compromise on the taste of the dish. But in this recipe we have used the brinjal in roasted form. So even with less oil also this brinjal preparation tastes excellent. I am a new member to your site. I live in USA and after seeing your website and the receipe description I could not stop but praise the good work that you are doing on ur site. 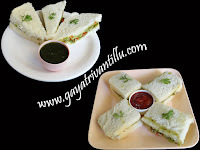 Please keep up the site running with new recepies and in telugu. I will from now on try few of ur receipes and keep you posted. All the very Best. 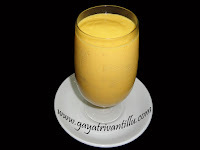 recently i hv known abt u'r website n it's really helpful for us..
gayathri garu pls show us the rava kesari receipe.